How can you not love movies from the 90s about technology? Especially computers. Everything was so new and foreign back then. Most of us didn’t know jack about those ever-shrinking boxes of information and even less about this internet thing. I love these movies so much, I’ve given them their own category and can’t wait to explore even more as time goes on. I’ve got War Games and Hackers high on my Netflix queue right now. In the mean time, I’m getting what I can off of instant watch. 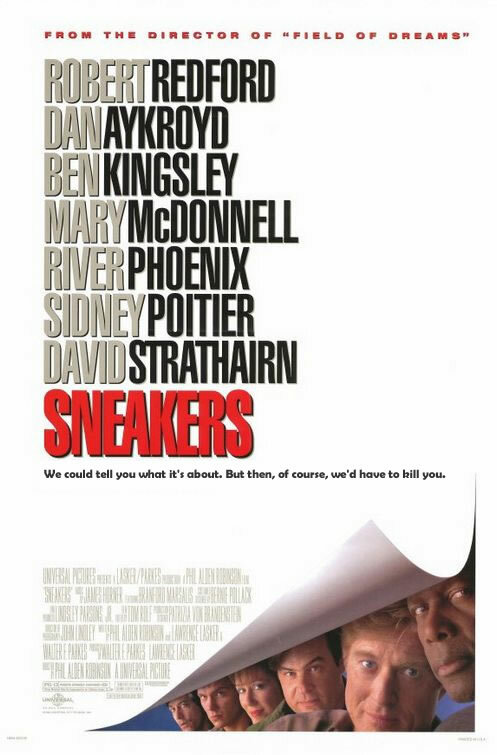 And luckily one of those options is one of my all time favorite movies, Sneakers. I have no idea why I first rented Sneakers back when I was a kid. I was 9 when it came out and don’t quite know when I first saw it, but I loved it and rented it a number of times and watch it any time it’s on TV, but this is the first time I’ve watched the whole thing unedited in a while and it still holds up. Had I not seen this movie when I was younger, I don’t know if I would hold it in such high regard. The acting talent in this thing is top notch as you can see from the cast list on the poster there and the computer aspects of the plot were probably groundbreaking at the time, but in the end it’s a heist movie. I would like to think that the subject matter and cast put this up there with the better heist movies, but I am definitely biased. The plot revolves around Redford and his business partners who test businesses security by pulling elaborate jobs to expose the weak points of their systems. What adds some depth to the movie is the fact that Redford and Kingsley used to be friends back in college who were on the forefront of the hacking world, stealing money from the rich (and right) and giving it to the poor (and left-ish). From what I’ve seen and read since, that really does fit in with the early computer mentality, so that’s cool. Anyway, some guys approach Redford, threatening to reveal his past crimes in exchange for them stealing a box that has a de-encryption key. They do, but it turns out they’re not from our government. Now they’re on the run and have to break back into Kingsley’s place to get the key back. It’s funny how much easier this stuff is to absorb after (ugh) 18 years of computer knowledge. Heck, I bet my folks could watch this now with no problems, maybe even my grandma who is impressively computer savvy. That’s what I like most about the movie, even if you don’t understand computers, you can follow the movie. I think it’s about time I got this one on DVD because the sound was screwed up on Netflix instant (the sounds were coming before the actions/sounds on screen) and I want to be able to watch it whenever I want. The Net is not a movie I want to own. It’s not that it’s bad, I did like it and it plays on some of my biggest fears, but I just don’t need to watch it all the time. The plot is as old as stories, but gussied up with a “new” technological coat. Sandra Bullock plays a woman who debugs computer software. She unwittingly gets thrown into events that have nothing to do with her when a fellow de-bugger sends her a virus that leads to some crazy de-encryption software. In this case, a guy who designed anti-virus software put a backdoor program in so he could do whatever he wanted, crash systems and then make more money when people panicked and bought his anti-virus software. The details aren’t all that important, but like I said, it plays on some of my fears. First off, since Bullock’s character is basically a shut in who doesn’t know any of her neighbors or talk to anyone face-to-face (her mom even has Alzheimer’s), the bad guy very easily changes some information about her on the internet and no one knows her well enough to say anything different. It’s kind of a new play on that old storytelling convention where no one believes the person who’s seen the crazy thing even though it really happened. That idea of not being believed when something bad is happening and also being so easily erased freak me out. There’s also the very popular idea that with a few strokes of the keys, someone’s identity can be erased or replaced with someone else’s. Identity theft hadn’t become a big dealin the meantime, but it doesn’t go quite as far as the movie does because almost everyone knows at least someone who could vouch for them and the whole “but computers can’t be wrong” excuse doesn’t fly anymore, but for a very brief time and for a very specific kind of person (basically me if I wasn’t married) this could have been pretty scary. Like being afraid of exploding Mini Disk players. I will say that, even though I don’t need to watch The Net again, the script is fairly intricate. There are all kinds of pieces that fit together for this story to work and make you go “Ohhh” later on, like her mom having Alzheimer’s. It just seems like a regular thing at first, but then it turns out to be an integral piece of the puzzle because her mom can’t identify her. So yeah, it’s a pretty good thriller, but also a fun look back at 90s internet technology. The chat room sessions with the creepy robot voices coming out of the computer reminded me of my Prodigy days, but without the text-reading because I’m pretty sure that was impossible back then. Anyway, fun stuff. Also keep an eye out for the big laptops and Dennis Miller in one of his less conceited roles!